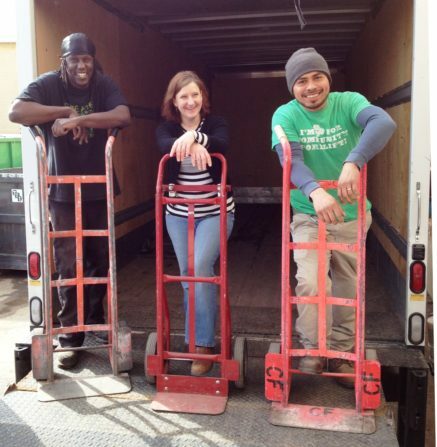 Community Forklift is seeking a Receiving and Processing Associate to work full-time with our growing green business. This person will assist with the receiving and processing of donated building materials. Responsibilities include cleaning, repair and organization of donated items, coordinating with the Pricing and Sales Teams for pricing and merchandising, and assisting with day-to-day operations of the warehouse and sales areas of the facility. Send a resume, cover letter and three (3) professional references to jobs@communityforklift.org, or by regular mail to Receiving and Processing Associate, c/o Community Forklift, 4671 Tanglewood Drive, Edmonston, MD 20781. Please, no phone calls. We are always on the lookout for outgoing people to help our Outreach & Education team as on-call contractors, or “Community Builders.” Our Community Builder team has a lot of fun at festivals and events throughout the region and here at the Forklift warehouse. 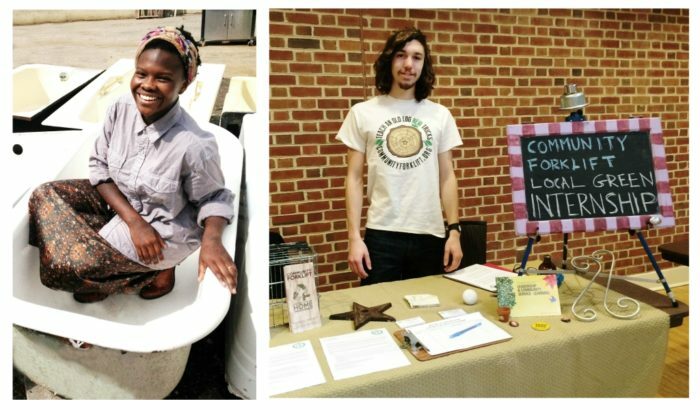 We spread the word about our store and community giving programs, and educate the public about local reuse and recycling options. 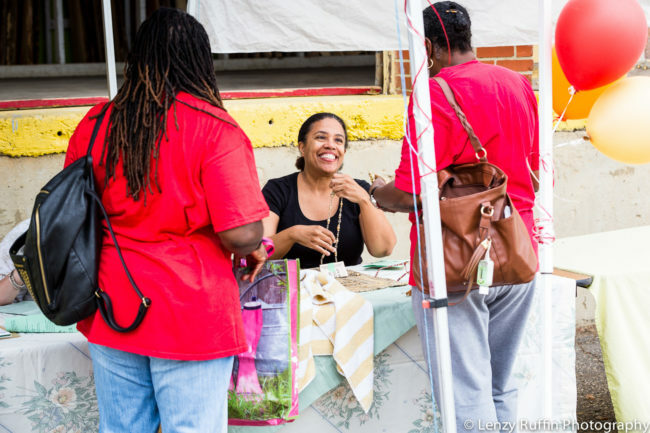 We need extroverts who can talk to the public at street fairs and trade shows, help at special events, host workshop presenters in our classroom, and lead volunteer groups at our warehouse. Our Community Builders are extremely enthusiastic, creative, genuine, and committed to the environmental and community work we do. • Flexible scheduling: This is an on-call contract position. Community Forklift offers internships over spring, summer, and fall terms depending on our staffing needs as well as applicants’ interests and skills. This is a great way for high school students (age 16+), college students, or career-switchers to get an introduction to fields and skills such as green business, sustainability, education and outreach, historic preservation, research, merchandising, or administrative work. Please find some of our general guidelines below, and feel free to email Ruthie Mundell at Ruthie@CommunityForklift.org if you have any specific questions. Hours per Week: A minimum of 8 hours per week, but full-time internships are also possible. Work Environment: Both office work and outside work possible. Casual, family-friendly dress code and sturdy shoes required. Warehouse is not climate-controlled, but our offices are. Compensation: Unpaid position. Reimbursement for travel. Thank you for your interest in lifting up local communities! Volunteer at the Forklift for a few hours, a day, or on a regular basis. Opportunities include greeting visitors, research and administrative assistance, helping out at community events, and cleaning or organizing donated items in the warehouse. We welcome individuals and groups of volunteers ages 16 and up. Seniors are encouraged to apply – you do NOT need to lift heavy items to be useful! If you are interested in volunteering, please fill out our volunteer interest form. If you are willing to lead a workshop about a repair or upcycling topic, please fill out our workshop presenter form. If you are a contractor or artisan, it’s a great way to serve your community, get some publicity, and meet potential clients. 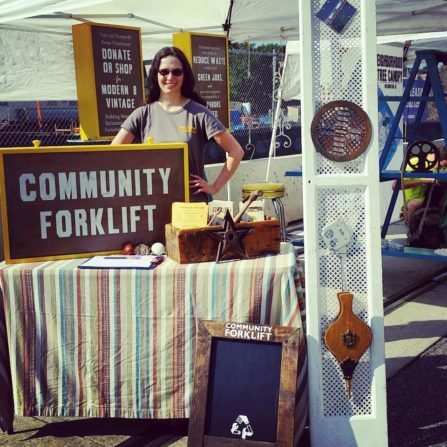 As a non-profit organization, Community Forklift relies greatly on the support of our community. When you volunteer your time and skills, we can get a whole lot of ‘Lifting done together!